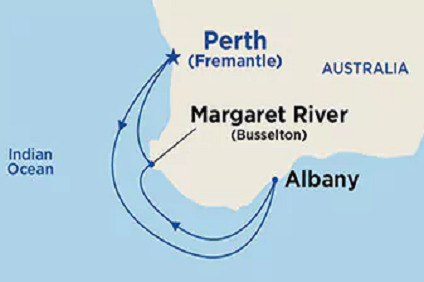 4 Night Cruise sailing from Perth roundtrip aboard Sun Princess. On December 26, 1826 - Boxing Day - Major Edmund Lockyer and his party of convicts and soldiers landed at Princess Royal Harbor to establish a penal colony. Originally named Frederickstown in honor of the Duke of York and Albany, the first European settlement in Western Australia was renamed Albany in 1832. Thanks to its superb harbor, the town quickly became a busy port. Albany served as a coaling station for steam ships, as a commercial outlet for the rich farms of the interior, and as a base for the highly profitable whaling industry. The whaling station at Frenchman Bay was the last whaling station in all Australia, closing in 1978. Today it is home to Whale World, one of the world's largest whaling museums. This vibrant coastal city is a laid-back charmer with an enticing array of natural wonders and active pursuits. Just steps from the mile-long Jetty are glistening white sand beaches and sun-drenched seaside villages. Yet the magic of the Margaret River area beckons with 120 premium wineries; ancient caves boasting a subterranean world of jaw-dropping stalactite, stalagmite, helictite and shawl formations; a fascinating Aboriginal culture rooted in ancient history; and a picture perfect landscape of meandering country roads and spectacular scenery.